I feel like this is such an issue with our generation. Our phones are like oxygen and we need them 24/7. I can't remember where I heard this, but someone was talking about how kids on school buses are just silent now and play on their phones the entire ride to/from school. It kind of made me sad. I was that kid that loved riding the school bus and getting to talk to my friends before and after school. My sister and I actually asked my mom not to pick us up from school so we could ride the bus. It was a social thing where we all told jokes and swapped stories. (I promise I'm only 25. I feel like I seriously dated myself with that last statement. Moving on...) I can totally see how kids nowadays just sit there in silence and play on their phones. 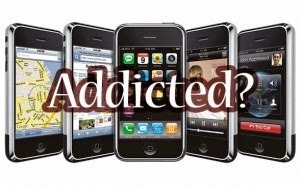 We are addicted. I used to be able to just sit there and watch TV. Now, I watch a show and decide to scroll through Instagram while I listen. Don't get me wrong, I think technology is great. There is definitely a time and a place for social media and phone games, but I don't think that is all the time. I have gotten into a bad habit of having my phone with me everywhere. Does anyone else feel naked without their cell phone? Seriously, it's a problem. I don't think I'm alone in this either. I think most of my generation can agree that we can't remember what life was like before the smartphone came out. What did we do when we were in a waiting room or on a bus or hanging out with friends? Oh yeah, we socialized. What a novel concept that is. Yesterday, I decided there needs to be limits. I'll still have my phone with me most of the time, but when Parker and I are hanging out or having a conversation, the phone stays in my pocket. When we are out to dinner with friends, the phone stays in my pocket. This may seem silly and trivial, but I think it will make a world of difference. When I am glued to my phone, I am missing out on real life. Having a conversation with my husband should be just that: a conversation with my husband. It shouldn't be a conversation with my husband while responding to texts and Facebook comments. I owe him the respect of my full attention. I know I hate it when I am trying to tell him something I feel is important and he is half-listening while reading an article on Facebook. I expect his attention when we are talking, so why shouldn't he expect the same from me? From here on out, I am making a conscious effort to live in the moment and not in the phone screen. Like I said before, social media is a great tool. I love staying connected to friends and family and seeing what everyone is up to. There is a time and a place, and I just need to remember that the time is not with my husband, and the place is not out to dinner. Life moves pretty fast. If you don't put down the phone once in a while, you could miss it. I am pretty sure that is how a modern-day Ferris Bueller would say it. I agree, I have started limiting my ipad time. LOVE this post! It really saddens me to think how many kids have smartphones at such a young age too, I'll be that "mean mom" who won't let their 8 year old have an iphone. Yes, yes and yes! I am going to try and do a no technology weekend with Joe sometime soon because I feel the exact same way. Nobody looks up anymore when they walk, their noses are always down looking at their phones. Good for you. As for Grandpa Har and me, we are not at all addicted as we forget that we have phones. Yes yes yes! Ryan Stewart implemented a rule in our house back in Milton which was no phone during our TV shows, in the car or at the dinner table. It's still hard sometimes but it makes a world of difference. My response was actually, "yessss, dadddd!" but the man has a point. I'll be sure not to text you during dinner or TV time if I can ever figure out the time difference correctly! I completely agree! I told my mom yesterday I wouldn't have smart phone if my husband wasn't going on deployment I will probably get rid of it once he comes back. I heard of this game you play if your out with friends to dinner that you stack all your phone in the middle of the table and the first person to grab their phone has to pay! I love this post! It's so true. We try to put our phones down at night (with the exception of Kyle's work phone). Yes, totally! I wrote about needing to put my phone down just this week too. It's like I have to take it with me from ROOM TO ROOM, like seriously? I need it THAT bad? It makes me even more sad to see kids hypnotized by phones now instead of laughing and playing and being kids. agreed! last night I made myself sit down, in a quiet house, and read. not look at my pinterest, blog, tv show, etc. just have some alone time to read!! and it makes me SICK and so ANGRY when people won't look at you during a conversation but keep checking their phones. That's what I do when i'm with my sweetie and I especially plan to do this during the weekend esp tomorrow nite. When I was on the lake today, there was no cell phone signal! It was actually great because it forced me to talk to my family instead of scroll through Instagram. I had to use actual directions instead of Google Maps because there was no signal! I've practically forgotten how to find my way by myself. I'm pretty good about leaving the phone at home if I'm going to dinner with my family, though! I'm really going to try to do this more often.. :) I'm definetly a self declared addict so for the sake of my life- I need to put it down! Oh well said. its SO easy to pick up your phone and check something but for some reason it feels so hard to NOT pick it up...weird world we live in. I've started to TRY and make a habit of walking in the front door from coming home and just leaving my phone in my handbag. not taking it out - at least fora few hours. the other thing I love that people do is when they go out to dinner everyone has to put their phone in the middle of the table and the first one to grab their phone has to pay the bill!! No one touches there phone till the end haha! This is so true. I have to make a conscious effort to not bring my phone, computer, or ipad in the room if I'm watching TV with my husband at the end of the night. I couldn't agree more! It drives me nuts how much people are on their phones, but I can't say that too loud because I am on my phone way too much as well. I would like to make a more conscious effort to stay off of it too! So true! I usually get pretty angry when I'm trying to tell John something and he's typing something on his phone! Yes yes, and yes! So very true that we need to focus on the present in front of us physically instead of our little screens. We have talked about this a lot especially with George on the way and how we are going to interact with him.